The Editorial Board of Natural Product Reports (NPR) is delighted to announce that Professor Konrad K. Tiefenbacher has been chosen to recieve the 2018 Natural Product Reports Emerging Investigator Lectureship for his work on applying supramolecular host structures in terpene chemistry. Konrad received his chemical basic education at the Technical University of Vienna and the University of Texas in Austin. After finishing his diploma thesis in the lab of Prof. Fröhlich, he pursued his interest in total synthesis of biologically active natural products during a Ph.D. in the lab of Prof. Mulzer at the University of Vienna. He then moved to Prof. Rebek’s lab at The Scripps Research Institute in La Jolla to learn about molecular recognition and self-assembly. 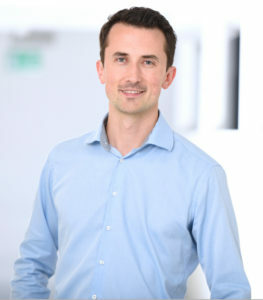 In December 2011 he started his independent career as a Juniorprofessor (W1-position) at the Technical University Munich. In June 2016 he was appointed to a dual tenure track assistant professorship at the University of Basel and the ETH Zürich. You can find out more about Konrad’s research on his webpage.